A team of Birzeit University engineering students has recently won the Gold Award at the 10th International Invention of Exhibitions and the 3rd World Invention and Innovation Forum (IEI & WIIF 2018), held in Foshan, China, for their invention of a prosthetic arm. The team, made up of Ahmad Al-Bisher, Ahmad Sajdyeh, Mahmoud Ashour, and Nasir Dalash and supervised by Professor of Mechanical Engineering Sameh Abu Awad, created an artificial arm that can be controlled via signals sent from the muscles, allowing amputees or people with disabilities to manipulate everyday items with ease. 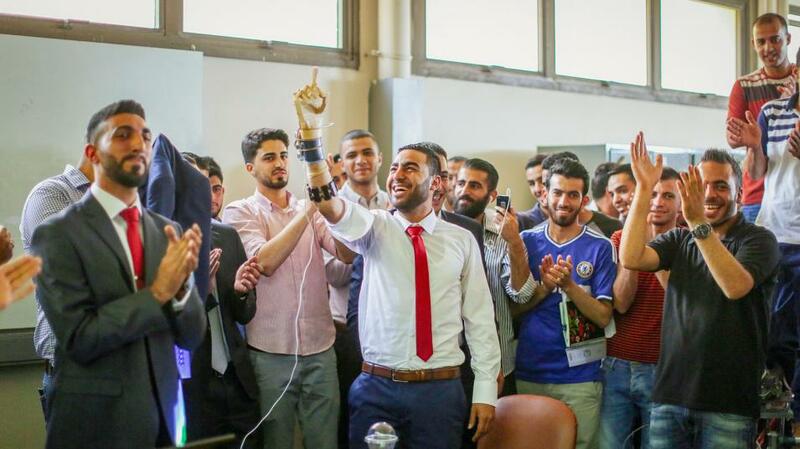 The idea for the project came from Sajdyeh’s own need for a relatively-inexpensive prosthetic arm after a bomb left by Israeli soldiers in Qalandiya amputated his right hand in November 2014. Sajdyeh contacted several international prosthetics companies in hopes of regaining mobility and dexterity, but the solutions they offered were extremely expensive. He also approached Palestinian charities and associations which help amputees travel abroad for prosthetic implants, but they also couldn’t help him. Despite the odds stacked against him, Sajdyeh didn’t lose hope and decided to create a prosthetic arm himself with the help of his colleagues. Sponsored by the China Association of Inventors and the International Federation of Inventors’ Association, the International Invention of Exhibitions and the World Invention and Innovation Forum present the world’s latest inventions, achievements, and services. The events include a professional committee of judges who appraise the inventions and grant Gold, Silver, Bronze, and Special awards.